The Sirocco is a Kaliphlin vessel that often patrols the eastern coast, hence the name (for the eastern wind). This is a warship entry for the Great Naval Arms Race (GNAR), a mean medium-sized war cog with veteran sailors, experienced troops and a wizard from Sultan's Gate for extra damage and support spells. The clear wood and lavender accents are deceiving, as most of its victims have discovered. Today, the Sirocco is testing new gear, new people and old wood in a test sail. 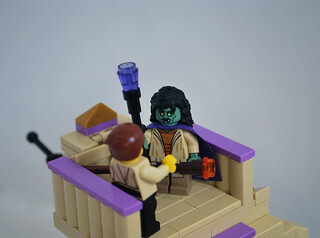 The captain is learning how to use a new artifact, the sextant, a recruit has just joined, and Tiin Mar, leader of the Tower of Wizardry, is consulting with the adjunct wizard. Do not hesitate to click on the images for better resolution (in Flickr) and a bit longer description on some! I believe the forecastle and the sail could be improved. 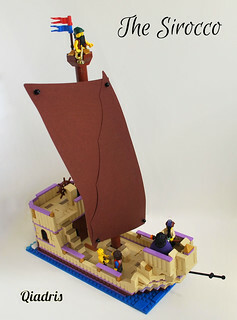 For the sail, I did try making a custom one, but doesn't seem to be my thing, but I am quite happy how using the lateen sails from Pirate Ship Ambush worked out. They are far too rectangular (as opposed to square) but it works. For the forecastle, all tips for improvement will be appreciated. Looks good. Not sure I'm personally keen on the lavender (not my favourite colour), but nice use anyway. I think the lavender with the tan makes a very nice effect. And the round window in the back is a great touch! Cool, the purple actually works pretty well for this build. Only thing is the circular window in the stern seems to be a bit low, but that may just be the angle of the picture. Wow! Love that color combo!! The window at the back is, as said by others, a great little detail! For some reason (can't pinpoint it exactly as I'm not a shipbuilder at all) the stern looks like it could use some improvement. Haha, Friends has made it's homebase in Kaliphlin! Interesting ship design, really cool entry! Good to hear lavender has been mostly well received :) Thanks for all the feedback, I guess if there's a new pirate theme coming as the new ship hints, I'll have to develop more shipbuilding skills. 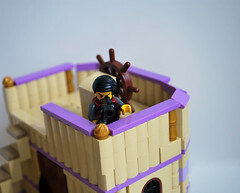 Actually, a minifig inside the cabin stands at face height, so it's probably the angle. Yes, it has! :D I bet half the ship or more is made with "Summer Riding Camp" pieces (the lavender, definitely, except for the also Friends light lavender half arches and pallisade). 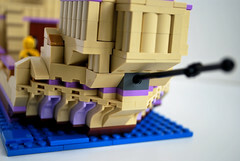 I like the colors used on the ship and that is all brick built, the front of it using those arc pieces is ingenious. Well done. I love the colours, and that sail is awesome! The ship is a little too straight-sided for me, I would be tempted to add a row of inverse slopes to bring in the waistline. Lovely details though with the arches, stern window, and waves at the back. Nice little ship qiadris! I like the unconventional colour scheme and the shape of the bow, especially the use of the PoP arches near the waterline. Medieval cogs often had those square-looking forecastles. However the side of the hull and stern could use some refinement. Using inverted slopes as robuko suggests is the easiest way to get a more natural rounded shape to the hull, 45 degree inv. slopes work well on the sides and taller slopes or half-arches work well at the back to give some clearance for the rudder. 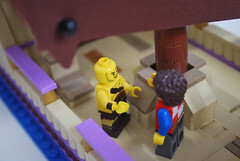 A quick look through some of the brick built hulls on the pirates forum or flickr groups that concentrate on ships will give you some good ideas for hull shaping.